Taipei, Taiwan (April 11, 2017) – ATEN, the leading provider of IT connectivity and total management solutions, today introduced a new member of the Modular Matrix Switch Series, the VM3200. 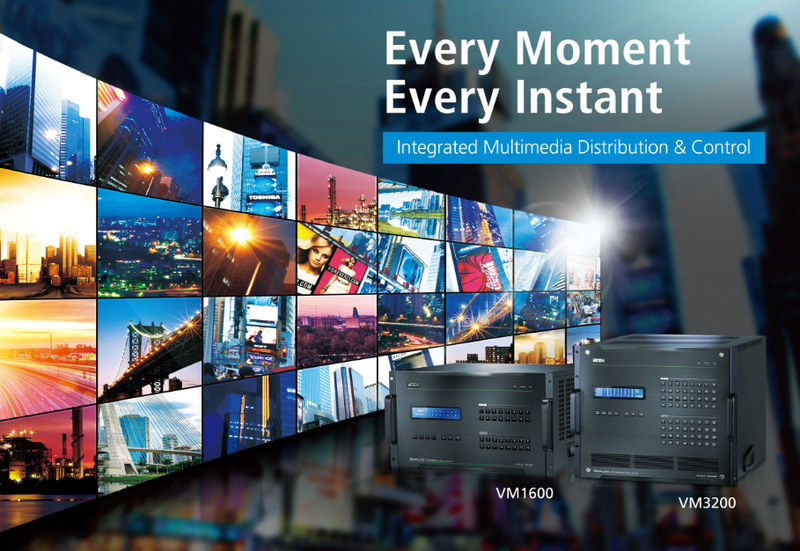 VM3200 offers real-time control and advanced access to manage up to 32 video sources and 32 displays simultaneously through modular I/O boards in a single chassis. Empowered by ATEN Seamless Switch™ technology, the video matrix switch, incorporating a speed-progressive video switching function and a unique scaler, integrates seamlessly with video wall systems to project live video with precision in any dimension on a perfect timeline. The VM3200 is the ideal cornerstone in retail spaces, training rooms, trade shows, security/control rooms or any large-scale A/V application. Powerful Built-in Scaler: Unify various video input signals and render optimum output resolutions on displays without delays or signal loss for uncompromised precision. Seamless Switch™ Technology: Control and change content in real time with instant video switching to deliver full HD video powered by an exclusive seamless engine implemented at each output port. Hot-pluggable I/O Boards and device parts: Allows video sources of any interface type to be routed independently to target displays of any interface, making it easy and flexible to cross play video in any matrix. Furthermore, the hot-pluggable fan and power modules provide higher reliability and flexibility of maintenance. Easy Video Wall Setup: Award-winning web GUI allows you to create custom video wall layouts easily. Up to 64 video wall profiles can be created with custom screen layouts. Real-Time Preview and Advanced Scheduling Features: VM3200 provides live streams of connected video channels and image previews of video wall layouts via web GUI. In addition, the calendar-based scheduling also provides connection profiles synchronized with real-time clock. Superior Video Quality: Supports 4K resolutions up to UHD (3840 x 2160) and DCI (4096 x 2160) with refresh rates of 30 Hz (4:4:4) and 60 Hz (4:2:0). “To provide the best solutions to the market, ATEN keeps pushing our limits to make more connection possibilities happen. VM3200 gathers all the up-to-date ATEN technologies in one box and it is perfectly suitable for any large-scale and modern A/V environments,” said Kevin Chen, President of ATEN International. For more product information, please visit VM3200 product pages. For more ATEN Modular Matrix Switch Series information, please click here.